In Aksu we didn’t do much but rest and nurse a sense of frustration at being in the hotel we were in, we also ate a lot; some of which was free as apparently being foreign does of occasion mean you get free food in China. After a day in Aksu we set off once more and rode out of the city and thankfully through shady green trees and crop fields rather than punishing desert. The trees also benefited us by blocking the wind meaning we could ride along quite happily without feeling that every pedal stroke was a fight. After a while it became clear that we were not on the road we should be – China has a few more road signs than central Asia but not many more and we’d missed the road we wanted. Also without google maps working properly it was quite hard to get on track if there were quite a few roads to take. 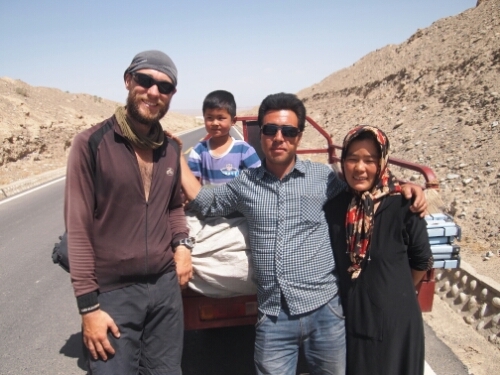 I managed through dead reckoning to get us heading back in the right direction after taking a few dirt paths and riding through Uighur villages that probably saw few strangers let alone foreigners. 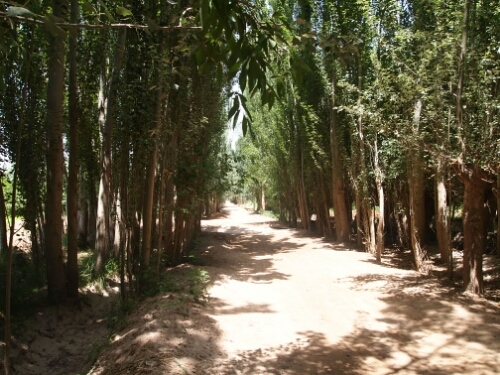 While heading back towards the main road we stopped for a snack and to stretch our legs in some shade. It turns out this was a mistake as we were approached by a man who was probably an off duty policeman, when he showed us his ID (not a police one) to indicate he wanted to see ours I saw a sew on patch that said ‘police’ on it. As I wasn’t a hundred percent sure whether he was official or not I thought it best to be polite. He was pretty confused by my passport and seemed to struggle with my nationality and Meka’s. Eventually he flagged down a passing vehicle to use their phone – James Bond he was not. After making some calls he made it clear that we should wait and eventually what appeared to be a police van turned up with another two policemen. At this stage I wasn’t really sure we were dealing with the real police as the two new arrivals had T-shirts under their China police bullet proof vests that said LAPD SWAT team on them which didn’t seem like it would be standard issue. They seemed pretty junior and even more confused by my passport than the other guy. At this stage we still had no idea what they wanted and were getting quietly annoyed as we still didn’t have great feelings towards the police after Aksu. Some more waiting later and a real looking police car turned up with what appeared to be a slightly more senior officer in it with a driver. There were now five policemen; we were well and truly Contained. The officer looked at our passports and seemed to be quite annoyed that he had been called up. He sent the other three policemen away and made some calls and finally told us to follow him back to the station. Luckily this was in the direction that we had been going in anyway apart from 2 kilometres at the end. Finally we arrived at the police compound and they took our passports to copy them, while we were waiting to get them back another car pulled up. The Official English Speaker had arrived. It was another polite Chinese lady who asked us a few questions and said that we had to register. I should have asked why as we weren’t planning on staying anywhere near that place but by that point I didn’t care. So after about an hour and a half of messing around we were allowed to leave, not until they’d had a look through my photos, I assume for anything incriminating, they got bored after about twenty shots of the desert. Having lost some more time pointlessly to the police we carried on riding and eventually the green trees and fields gave way to desert again. The change can be very sudden. One moment you are riding across a fairly lush oasis perhaps for twenty kilometres, the next it is dusty rocky desert. 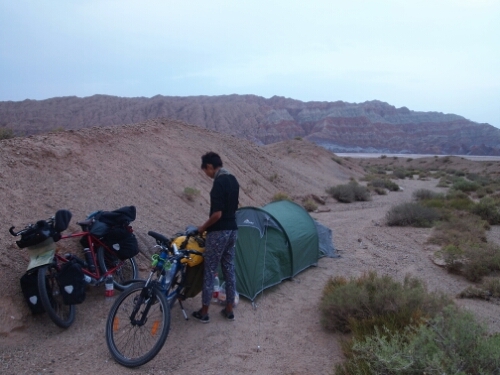 We weren’t in the desert long before another sandstorm started, luckily the intensity of this one was nothing compared to what we had experienced a few days ago and we could keep riding until we eventually found another dry riverbed off the road to camp in. The next day we continued riding through desert and strange rock forms. 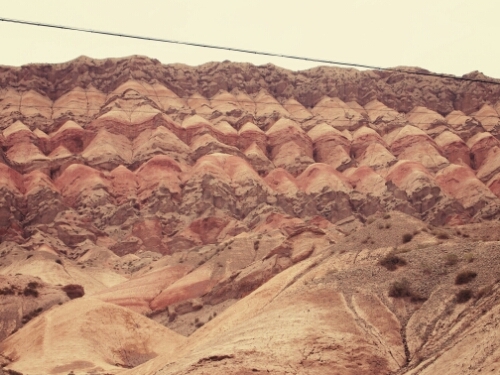 Some of the geology in the area is incredible with many shades of reds and browns in all kinds of shapes. 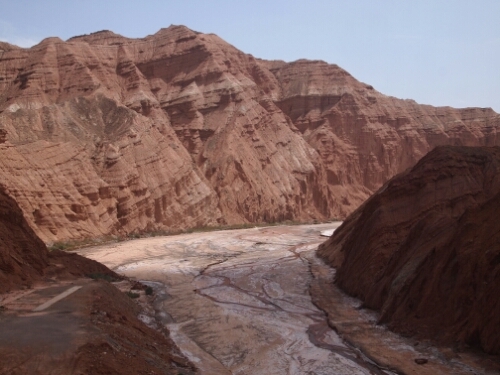 At the edge of this section of desert we reached another lush valley where we were stopped at a police checkpoint. I think the policeman was quite surprised when I pulled down my face scarf to reveal a full beard and decidedly un Chinese features. Having looked at our passports he took them over to his superior officer who told him to go and photocopy them – another half hour lost to the police. We continued onwards through the area known as Baicheng County, stopping for dinner at Baicheng City. Here we were able to get some steamed rice and scrambled eggs and tomato without trouble courtesy of some phrases my friend Alex from home had sent me…Thanks Alex! This tasted a lot better than the rubbish Uighur noodles we’d been suffering through. 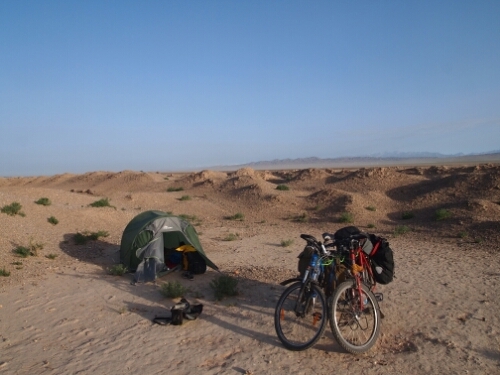 After dinner we rode on further and got back to some more deserty land where it is less pleasant but much easier to camp as there are a lot fewer people around. 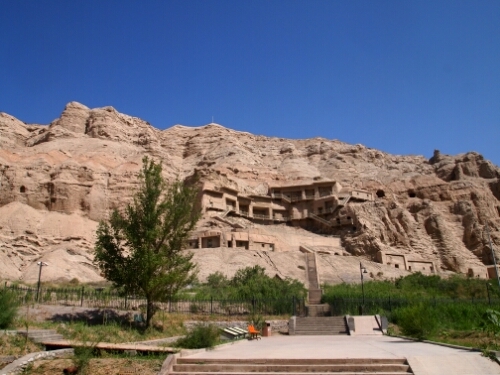 The following day was to include some cultural activities as I’d heard the Kizil Thousand Buddha caves were worth seeing and they were pretty much on the way. Sadly after a 10km each way detour to them through the heat of the desert and a GBP 5.5 entrance fee I was proved wrong. They were not worth seeing. There were only six caves open and most of the paintings had been destroyed in the past by Muslims or the Red army so there definitely weren’t a thousand buddhas. There also wasn’t much information about them unless you wanted to pay another GBP 10 for a guide so I was a bit annoyed. No pictures were allowed inside. 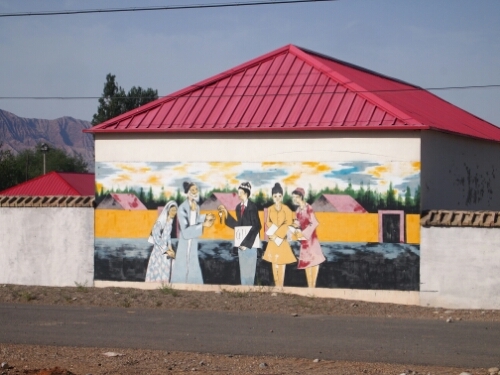 What was more interesting were the murals painted on the side of Uighur buildings throughout the region. Some of them were quite pretty and some downright weird and confusing. Most of them appeared to have been painted on for educational purposes by the government. After the disappointment of the Buddhist caves we were cheered up when a kindly Uighur family flagged us down to eat watermelon with them. They also gave us some bread to take with us and offered to give us a lift as through the miracle of sign language they indicated it was going to get hilly. I declined before Meka got any ideas. And off we went and it did get hilly and there was very little to see apart from a couple of police check points which we got through without being stopped. We then arrived in Kuqa where we wanted to get some food before continuing to find somewhere to camp. Unfortunately the police found us first, a guy in a patrol car pulled us over to check our passports. I foolishly had not had my face scarf up and he had spotted my bushy beard which is a give away at a distance that I’m a foreigner. Though he was in an unmarked car he was definitely police, it said it on his T Shirt and he even flashed ID. So again began the waiting as yet more police appeared to deal with the dangerous foreign threat that we presented. At the most I counted around eight police officers around us, most of them had stopped out of curiosity to see what was going on, I guess it was a shift change. Eventually the key car pulled up and another Official English Speaker appeared: another polite Chinese lady. Do the Chinese police employ no male English speakers? Or is English a girly language and I never knew? Anyhow she asked us a few questions including the important ones such as ‘how long have you been in Kuqa?’ and ‘Why are you here?’ To which the answers ‘About half an hour’ and ‘To get dinner and then leave’ seemed to satisfy her so that she could safely let us go and be someone else’s problem further down the road. So after another 45 minutes wasted with the police I started to wonder if almost every day would involve some sort issue. Thankfully though that was to be the last to the time of writing. After the police we had trouble getting out of the city as the road we had been riding on had turned into a highway with big signs saying no bicycles so we had to try and find the old road. Eventually we did and we thus managed to work our way out of the city on a smaller road which followed the route of the highway for the most part. 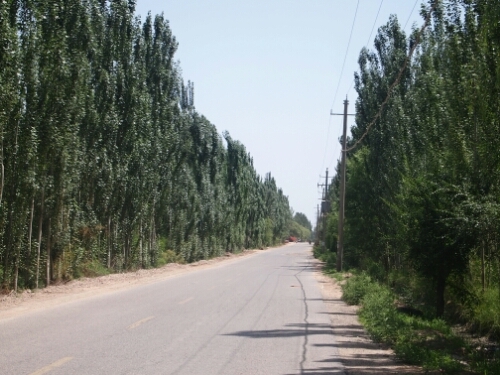 Then the road ran out, gradually becoming worse until it became a mud track leading off in the wrong direction through Uighur villages. At this stage we were a little panicky as it was getting dark and we hadn’t found anywhere to camp and we weren’t sure where to go. Asking some men by the side of the road they indicated we had to ride on the highway and that there should be somewhere to sleep a bit further down. A bit further down not being a measurable distance due to communications issues. So unhappily we snuck through where someone had cut the fence running along the highway and manhandled our bikes over the crash barriers onto the hard shoulder. Then with my lights on and Meka riding in front (Meka’s is a bit of a stealth bike since she broke both her lights) we rode towards some illumination which we assumed was where the men had pointed. This turned out to be a toll centre for the highway. Asking if we could camp on their grounds we were denied until another guy turned up and Meka practically begged him to let us camp somewhere. He clearly feeling sympathetic to her pleas made a phone call and then led us off in the darkness down the side of the highway. At this point we had no idea if he was escorting us away, showing us a spot by the highway to camp or taking us to his home. Having walked down a bit we then crossed the highway and ended up at the equivalent of a Chinese motorway service station. Here we waited a bit while he made more phone calls until a Chinese girl who could speak some English appeared. Then we waited a bit more outside a supermarket, still unsure exactly what was going to happen. Then we were led upstairs, to what I didn’t know – someone’s home above the supermarket or a storage room – it was inside at least. What we got was perfect in the end and we ended up staying in what must be some sort of motorway workers’ dorms. We got our own room and there was even a shower and toilet which was a boon after two nights camping and sweaty riding. The people were very kind and even gave us something to drink and eat as well, they really went out of their way to make us comfortable. It was certainly better than camping in the desert again. Outside of a lot of places like hotels, shops and petrol stations there are usually riot shields and helmets, here though there was also spears. 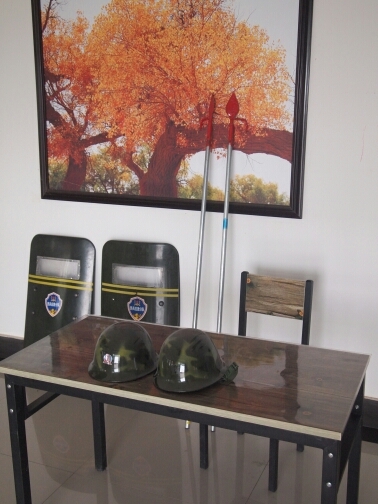 I later learned that these were for defence in case there were any Uighur terrorist attacks. The next day we left feeling quite refreshed, we were also able to eat a substantial breakfast at one of the cafes there. I say substantial as its size was the only thing good about it – it was greasy Uighur plov which is basically rice with unidentified meat – though in this case it was rice with bone and fat. One at least hoped that the rice had some energy in it. We were riding on the highway now which at least meant the road was good even if it was boring. It was pretty much desert, desert desert with the occasional cluster of small houses or factory or mine. This went on for the first part of the day until we went over a hill. Then we got hit by an incredible crosswind which we crawled against for two hours making little headway. At this point we decided to take the next exit and head into the city of Luntai to have an early rest day, this turned the crosswind into a tailwind and we sailed into town. In Luntai we had more hotel shenanigans as we again found a nice cheap hotel with everything we needed and again we were kicked out. This time the police didn’t get involved, instead I think we were checked in by a junior staff member who didn’t know any better and then when her manager turned up he must have said that we have to go as they couldn’t register us. In his favour he found us another hotel and drove our bags over there while we followed on our bikes. The hotel was a little more expensive of course and didn’t have Wi-Fi either. On the plus side breakfast was included and it was a much better one than we’d been subjected to in Aksu. Luntai was a pleasant enough town and we were able to stuff our faces with food, stock up on snacks for the road, get our bicycles checked over and have a rest.